Most of September and October has been spent waiting for services to actually do jobs as agreed meaning we had to leave Silhouette on her berth “on the off chance someone might turn up”! The standing rigging has now been finished, so one of the last big jobs ticked off. The bespoke arch however hasn’t been finished despite giving the fabricator 7 weeks…… not impressed at all, and a promise of completion next weekend. 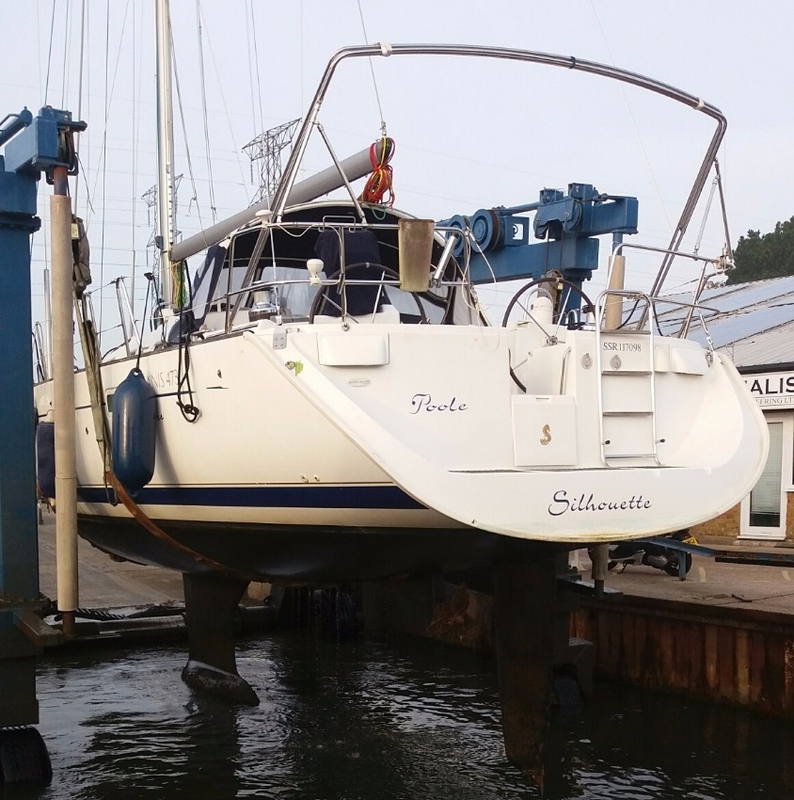 As we approached the travel hoist we were waved straight into the slings which although very efficient, Silhouette did take the foreman by surprise as she was one of the beamiest yacht they’d lifted and only had another 6 inches available on the hoist. Once in the cradle we took a look at the cutless bearing and noticed a little bit of play so will replace it, and there’s movement in the bottom bearing on the rudder which is fairly common with 473’s. Generally the bearing itself is fine but the copper sleeve around it needs replacing. We hope to be able to do this without dropping the rudder out completely as we’d need to be relifted….. at a cost! Our cannister liferaft needs mounting on the transom, polish and antifoul to complete too. We have 10 weeks to get everything done as we must relaunch on the 13th January to avoid extra charges and an upset yard foreman. Sounds like more than enough time but it’ll go by in a flash. To keep us focused, when we relaunch it’ll be 14 months until we’re off !!! An unexpected purchase has been a new genoa to replace our existing 150% which we thought was fit for purpose. Unfortunately after having our arses kicked by friends on a Westerly Corsair and being told our sail was “baggy” which meant it had stretched and won’t set properly, we looked into a new one to stop the embarrassment and ribbing. 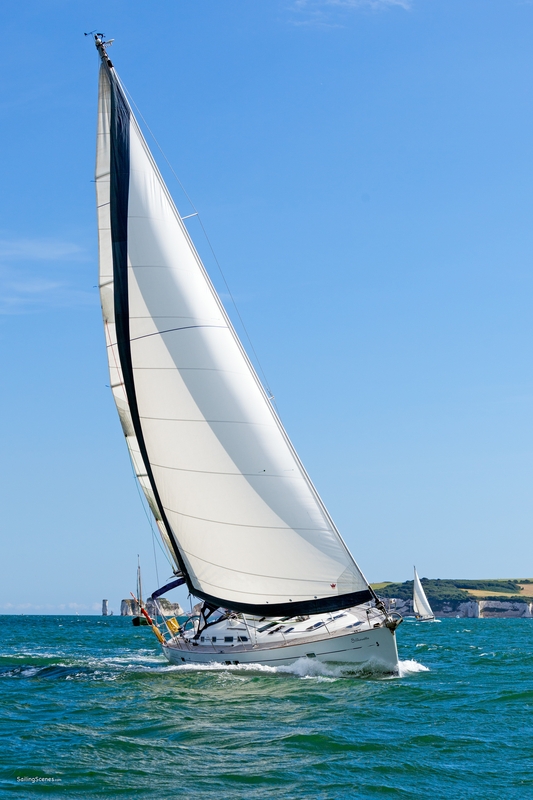 Stainless steel fabricators really need to talk to sailmakers about service…. 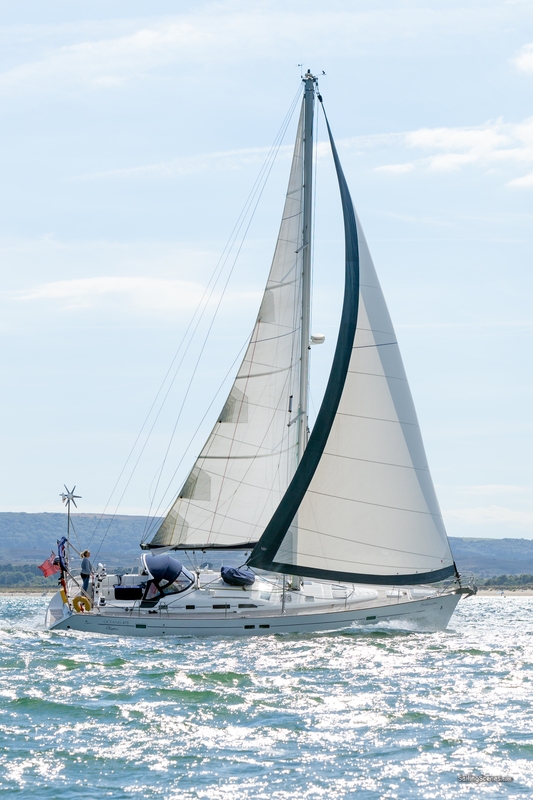 We finally decided on Kemp Sails in Wareham who have made a 130% performance genoa with a number of extras making it more suitable for our needs including the new weathermax UV strip which apparently out performs in durability anything else. We were going to buy a cruising chute too but have a Quantum AP spinnaker and can’t quite figure out what it is. Flying it last weekend with friends Nick & Carol on board to help, Nick said he wasn’t too sure either. The general feeling is it’s a bit of a hybrid so I will need to email Quantum sails in South Africa to find out. 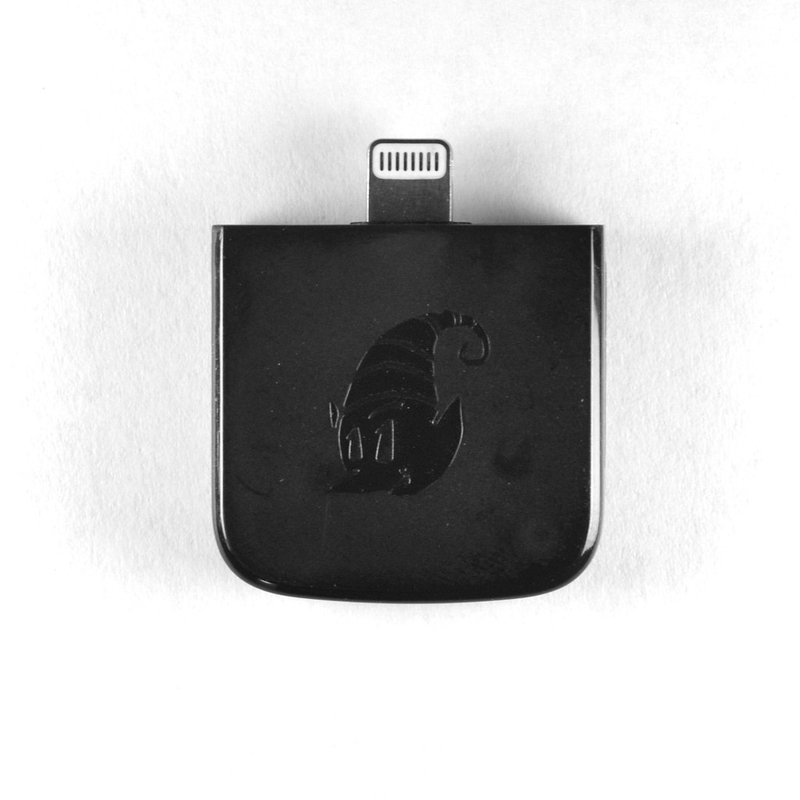 So far it looks promising and we may well not need to buy one now…. fingers crossed. In spite of this we really are getting there, we want as much done before the season starts again in 2017 so we can iron out any issues without worrying about it as we approach 2018 and the off. 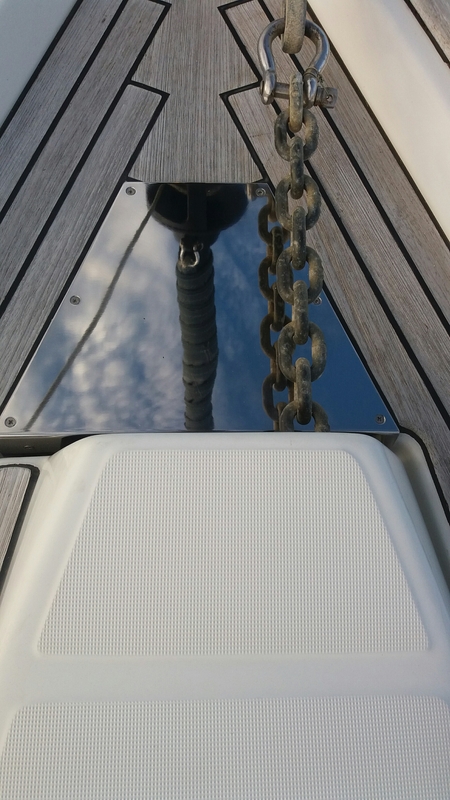 The teak decking in front of the anchor well was starting to wear away as the chain was bouncing up & down when being deployed, so we have fitted a stainless plate which folds down into the well to take the wear. It looks great and fits really well which will last for years. 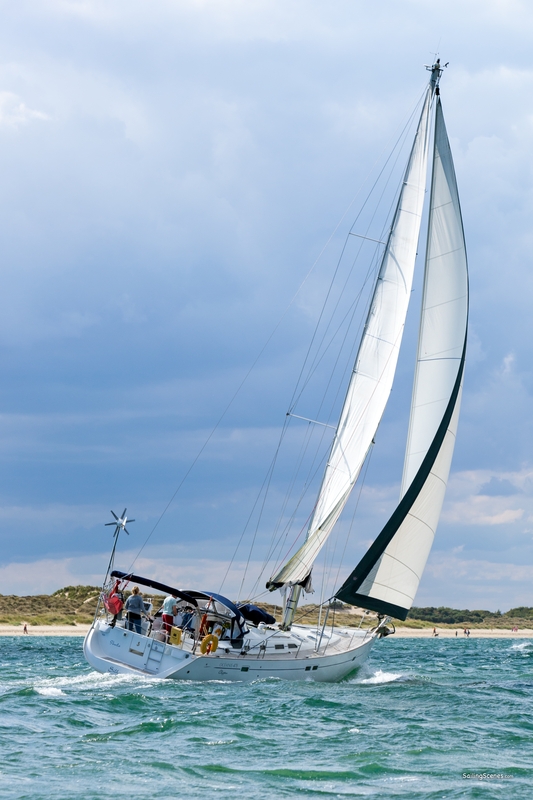 The 2016 Southampton Boat Show is upon us and this year we will go with a plan to visit specific stands. Sailfish Marine have just taken on distribution of an Australian watermaker called “Rainman” which is portable, simple and apparently able to produce up to 120 litres an hour! Satellite phones and email systems suppliers along with Ocean Safety will be visited too, so a busy day ahead. The result was we bought the photos as they are the best action shots we have of Silhouette. Author ian moorsPosted on August 11, 2016 March 1, 2017 Leave a comment on What’s that RiB doing? Time seems to be racing by this season and summer has been somewhat elusive too making time on board special. Our daughter Charlotte has been in France working with Rockley watersports since the 9th June and apparently the weather’s been great too……. thanks for that ! A couple of weeks ago I spent an hour under water cleaning off what can only be described at a coral reef from the bottom of the keel. At low water springs the keel sits about 30-40 cm in the soft mud on our berth and the growth of sealife was quite surprising. Studland bay is the perfect location to do this as the water is a clear enough and calm, until the jet skis and water skiers turn up ! 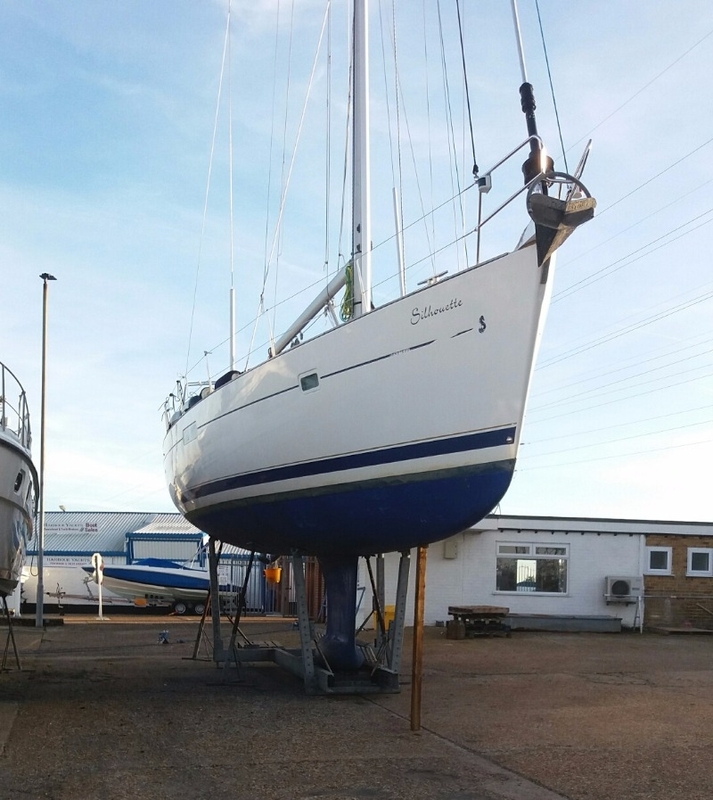 We finally decided on which company would change the standing rigging, and on Monday 19th September Silhouette’s mast comes down and “Quay Rigging” start work. Although the job will only take a week we can’t re-step for 2 weeks as we have to wait for the next full spring tide. When it’s done we’ll post before during and after photos and details including costings. 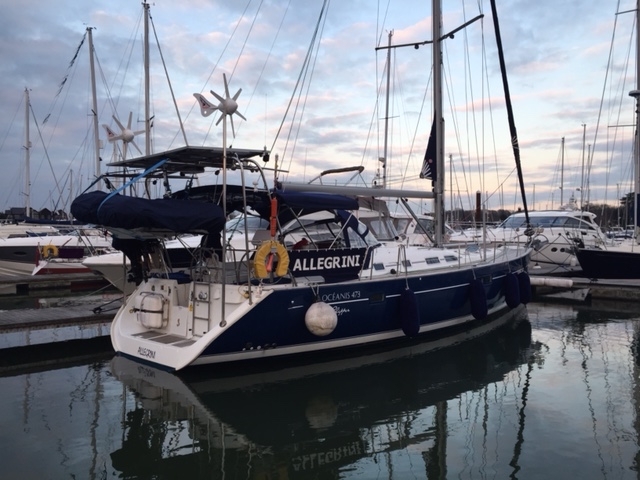 As mentioned before, we had made contact with Steve & Helen who own “Allegrini” another 473 and arranged to meet up during the summer. Last weekend we finally managed it in Yarmouth. Our trip up on Saturday morning was in poor visibility with sea mist and fog all the way but the sun finally made an appearance as we reached Hurst castle. A first for us, and quite exciting to be meeting fellow cruisers who would be leaving the UK when we do and following similar routes as far as Gibraltar at least. What a great couple they are, good company, funny and knowledgeable. I mentioned I couldn’t get the AIS to show up on the cockpit repeater so Steve said “I can fix that”……. after many visits to both stations i swear if I’d offered him a hammer he would’ve used it. Suddenly it started working, well done Steve. On the sail back to Poole both e80 and e120 showed the AIS to be off again but on checking marine traffic our entire track was there !?! The last software update for these units was July 2012 which we have so I shall do the same thing Steve did next weekend….. I’ll keep the hammer handy! We had spoken about having a completely independent chartplotter in case anything happened to the Raymarine units i.e. lightening strike or power failure, Steve said “you need a bad elf”….. Sounded like a dodgy character in a pantomime to me but sure enough it does exist. Back in March we picked up a fishing net around the prop which needed a diver to clear (the water was way too cold for me!) which was the first time for us in all the years of sailing. 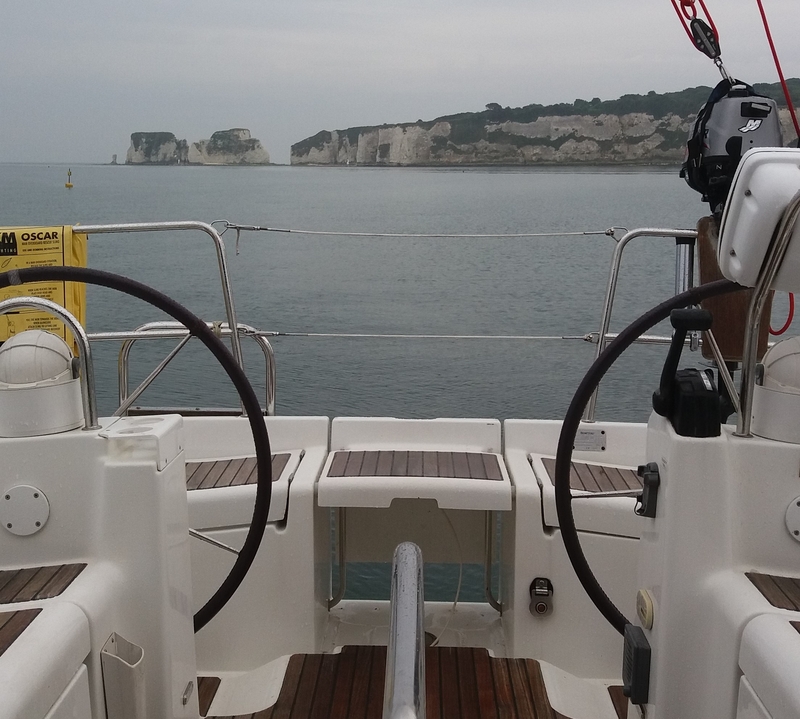 Well, we got another one last weekend when motoring down the Swash channel towards Old Harry Rocks. We heard a thump followed by a rumble and vibration through the cockpit sole immediately thinking damage to the prop, bearing or another net. This time however we were prepared. 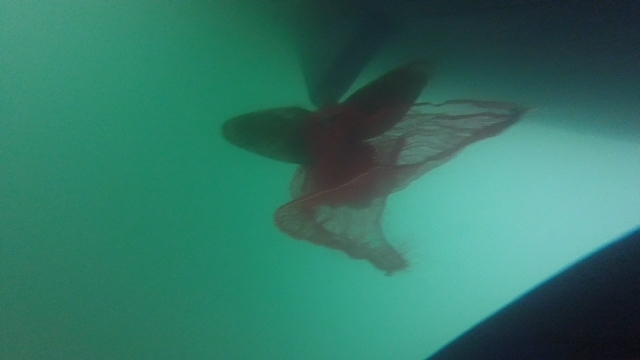 We dropped the anchor just outside the channel near the rocks and taped our GoPro camera to the boat hook, and the result was a net sack meaning it was time for me to put on the wetsuit and clear it away. We are net magnets !!! Whilst working on the job at hand I was pleasantly surprised to see the hull fairly clear of barnacles and build up of sea life, just some slime which can easily be brushed off. We’d decided in the end not to come out of the water earlier this year and would monitor instead. As Silhouette will be ashore from October for a few months having work done, we couldn’t see the point. Seeing how clear the hull was meant it was a good decision…. wow we got something right !!! So what hasn’t changed? Yarmouth itself is exactly as we remember it including the damn fine beers on offer and the tardis that is Harwoods chandlers. I wouldn’t want to do an end of year stock take put it this way….. I noticed another 473 on a finger berth so went over to say hello and cheekily had a tape measure in my hand as I’d noticed their liferaft was atttached to the stern just above the “stupid locker” and wanted to see how much room there was around it. I’m not happy with our valise tucked away in a locker, it’s heavy and If the worst ever happened and it needed to be launched I want it done quickly and easily. Introductions done and measurements taken we had a quick chat like you do about our boats. 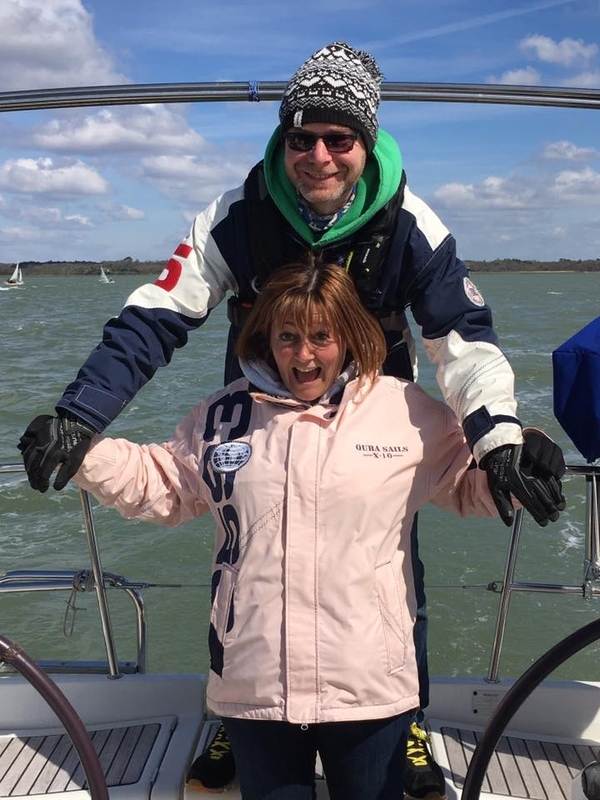 My apologies, but I’m rubbish at remembering names I do know they keep the boat in Swanwick marina AND that it wasn’t Steve & Helen from Allegrini ! After a great night on board with surprise visitors Lee & Julie who arrived by RiB from Lymington as it was getting dark, we readied ourselves for a beat against the wind and tide (by choice) with a westerly force 6 to look forward to. As we punched tide just outside the harbour we heard a mayday from a 39 foot yacht that had left the berth in front of us about 45 minutes earlier. They had been dismasted and drifting towards the rocks of Colwell Bay. We were about 25 minutes from them punching the tide but the Yarmouth lifeboat got there in 15 from the mayday going out ….. mightily impressive. 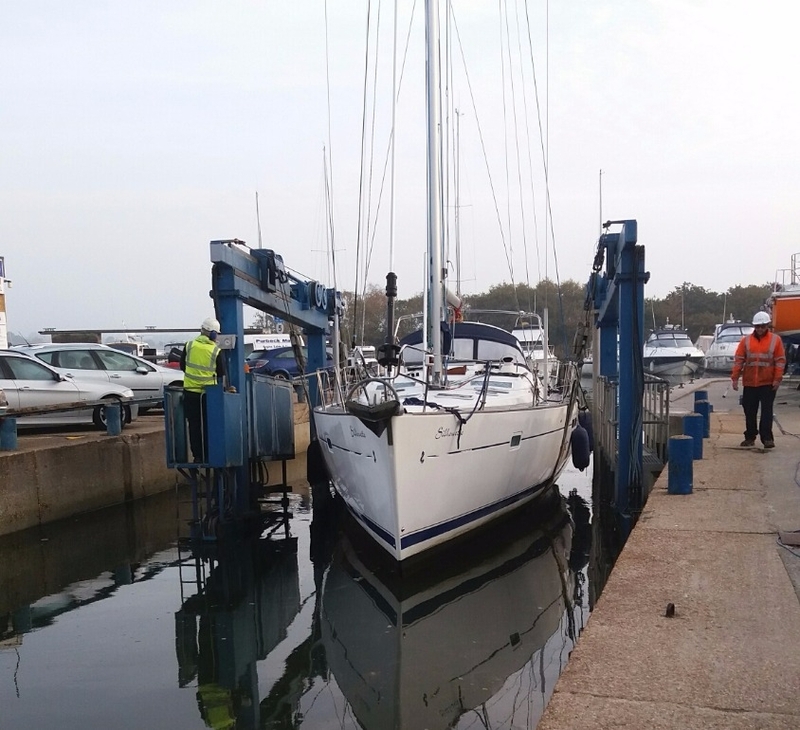 No sooner had they recovered the rigging and towed the yacht back to port, the lifeboat was called out again to an 85 foot yacht with engine failure. We got to see the lifeboat at full speed passing us twice in one afternoon. The tow this time was the biggest tow the Yarmouth lifeboat had done to date. leaving me to decorate her bedroom and find a fault with our Raymarine AIS system which reboots whenever it feels like it. Hopefully it’s just a voltage drop due to bad connection, just got to find where the unit is on board now ! The saga of Carolines broken finger will be updated during this entry but as there will be photos I thought i’d warn those of a weak disposition!! 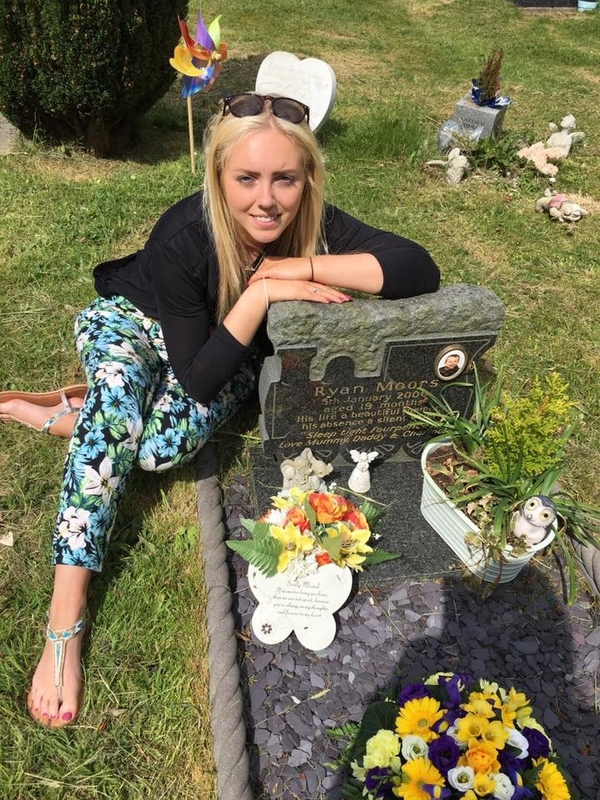 Before that and not of a nautical nature, Monday 16th May was our daughter Charlotte’s 18th birthday…….. where has the time gone? Caroline and I couldn’t let this major event pass without mention of her twin brother, our son Ryan who died when he was 19 months old. To us they are both 18, we all miss him terribly despite the years and this picture and facebook entry from Charlotte says more than we ever could..
“Guess what little bro! We’re 18 tomorrow!! Gone but never forgotten have a drink for me up there because I sure will have one for you down here! 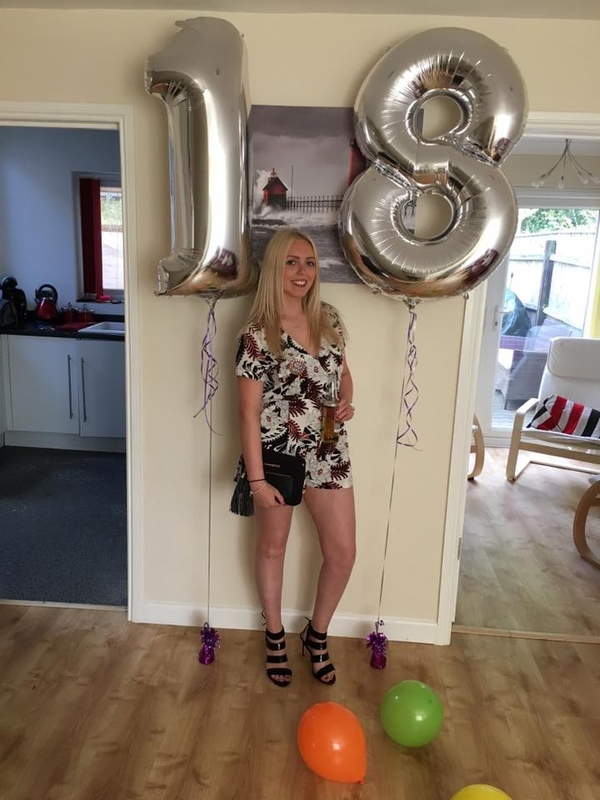 Charlotte didn’t want too much fanfare on her birthday but the Rockley btec students had other ideas and arranged a surprise party for her at our home. not before throwing her fully clothed off the jetty first though……. I have never seen so many empty bottles and cans AND the music was sooo loud. Apologies to the neighbours ! She is off to the south west of France in early June to spend the summer working as an assistant watersports instructor for Rockley Watersports as part of her course. The course, facilities and instructors are great and Charlotte is so at home there. 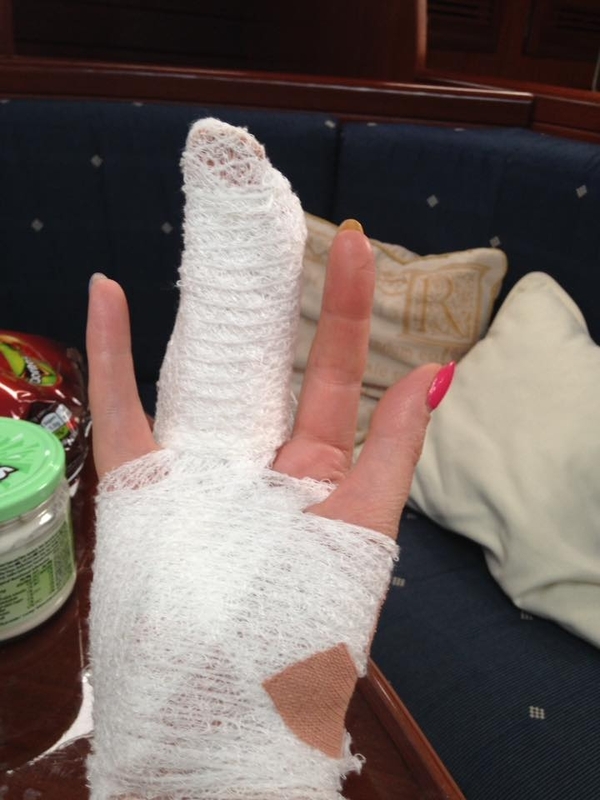 Carolines broken finger now has scaffolding around it that looks something else. X-rays now show a spiral fracture in 4 places and she’s not at all happy. She sees a specialist next week who will decide whether to insert pins or leave the scaffolding in place. To be fair, it does look painful but I can’t help thinking the scaffolding with the used balloon on the tip is overkill but it needs to heal and is a great conversation starter. This has given us time to look at the list, yes the list, and this weekend our home port of Poole held its own boat show. It’s nothing too grand as the event is only in its 2nd year but give it chance and with the backdrop of Poole harbour who knows! My business exhibits each year at the RYA Dinghy show which is where I first saw the FRiB design. As luck would have it they were exhibiting in the Poole show so both Caroline and I spent some time on the stand discussing size and suitable engine. As usual I wanted to go for a FRiB360 but the Salesman and Caroline felt a 330 was more than big enough and would take upto a 15hp outboard although a 9.9hp would be more than enough to speed us and payload along. Having read numerous blogs in recent years, it seems most cruisers have had to buy hard bottomed dinghies within a year of departure as standard inflatables just can’t stand up to the pounding given to them. 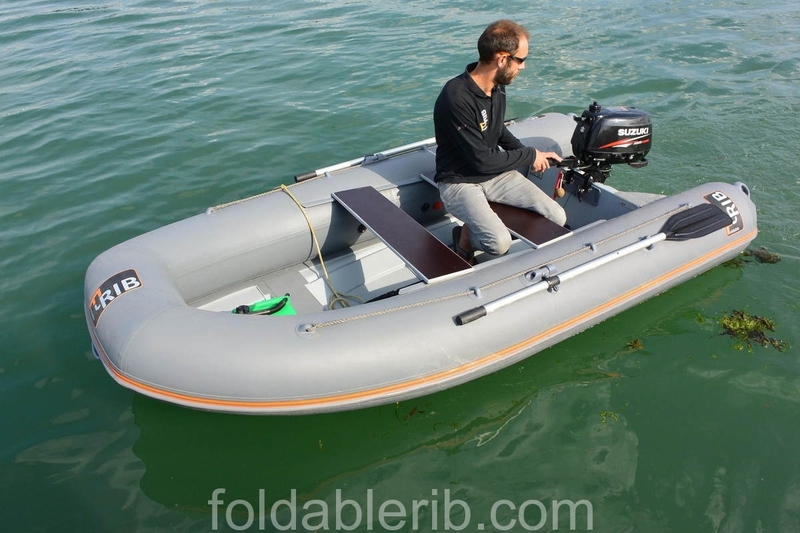 The FRiB is an ingenious design in that it is a folding RiB. The ability to deflate, fold into a small area and stow on the coachroof sold it for us as we don’t want to put davits onboard. We have a Mariner 6hp less than a year old so will use that until nearer our departure unless we find a great deal and “fingers” goes on the charm offensive. We hope to collect the boat from the dealers in Hamble point Marina before the bank holiday so we/I can play !!! We introduced ourselves via email to Steve & Helen who own another 473 based in Swanwick recently and have agreed to meet up this summer. They have their own blog running www.allegrini.co.uk which as it turns out shows their departure date as pretty much the same time as us. They’ve even started a countdown clock which makes it all the more real. Having seen the clock we thought we’d actually compile a list of the jobs that need/should be done prior to our own departure. To be honest I hate lists as there’s always something else to add. That said we both feel if you wait until the boat is 100% finished you’ll never actually leave the berth!!! Someone said (so I’m told) that blue water sailing is boat maintenance in warm weather ( or something like that), so in reality there will always be something to do. Obviously it’s important to get all the big known jobs done before leaving along with all safety issues, we have however been extremely lucky to have found a boat having just returned from an Atlantic circuit and owned by a very fastidious family who prepared Silhouette so well. Most of these can be done with Silhouette still in the water and won’t take very long at all, some of the big jobs will be done at the same time whilst ashore this winter. With that compiled we thought a weekend sail was in order and arranged to meet up with our cousins Lee & Julie in Lymington where they live. We had a cracking sail up in a NE5-6 with 1 slab in the main and 2/3rds of the genoa rolled out reaching 9.6kts over the ground (about 8kts through the water) and Silhouette sailed like a dream. As we approached the Needles fairway buoy we started to roll in the genoa as we were heading straight into the NE wind when the genoa sheet whipped just like a tea towel flick and caught Caroline on the side of her finger. Initially it looked dislocated as it certainly wasn’t pointing in the right direction! 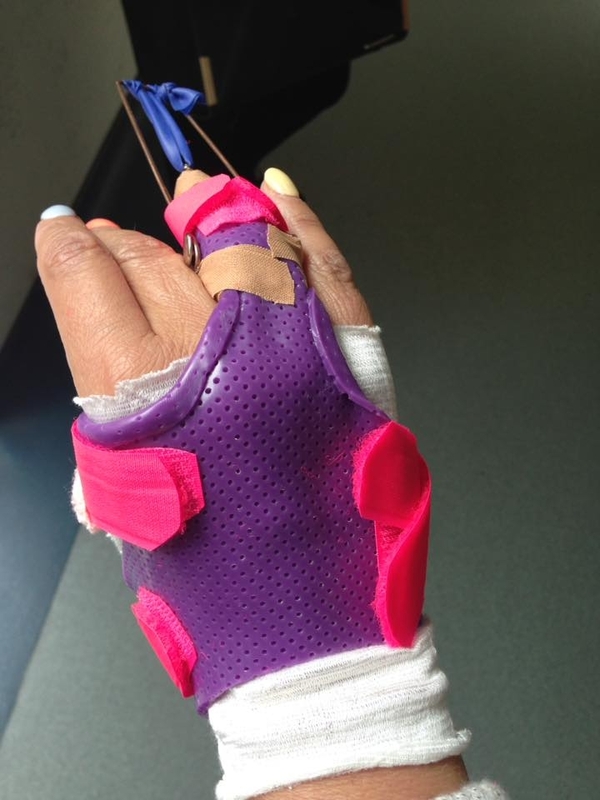 She bent it back and strapped it up but a visit to Lymington Hospital showed a double break with an unstable fracture. The doctors were surprised Caroline popped the finger straight….. she’s made of strong stuff is my wife !!! 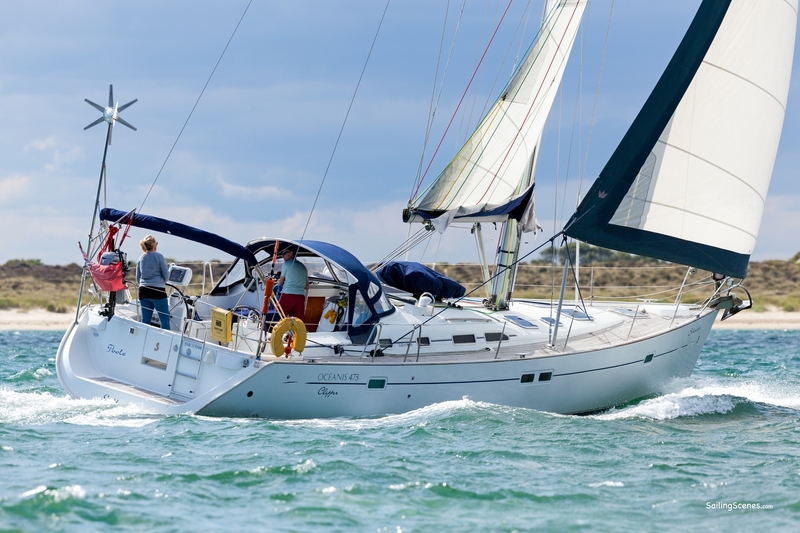 The return trip to Poole promised NW-5-6 meaning a cracking sail back so we asked Lee & Julie if they wanted to come with us, we didn’t need to ask twice. Leaving the overnight berth we’d been allocated at Lymington Yacht Haven wasn’t as difficult as we’d first thought even though we did have to reverse all the way out to the river before relaxing. Then once in the Solent it was time for Silhouette to show our guests what she could do. 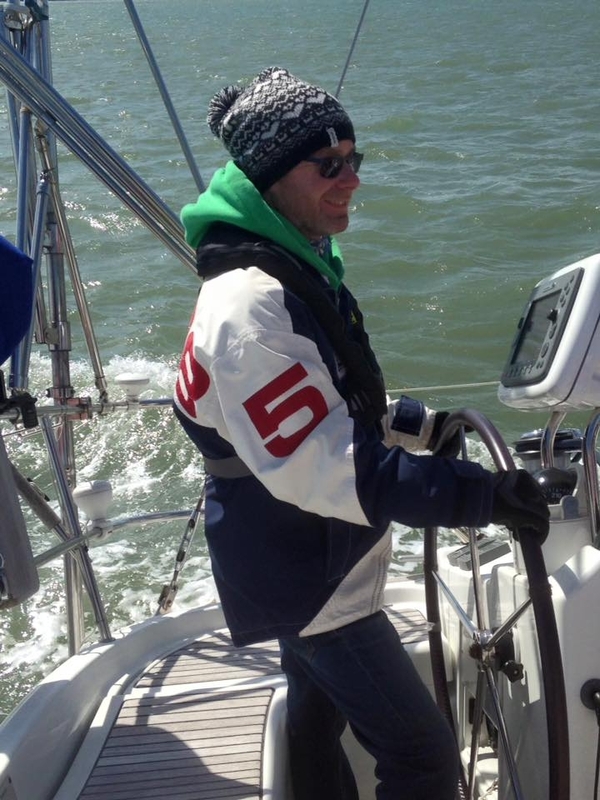 Lee is certainly a sailor as he’d sailed for many years with his dad Colin who introduced us to sailing in 1990, and we just couldn’t keep him off the helm! 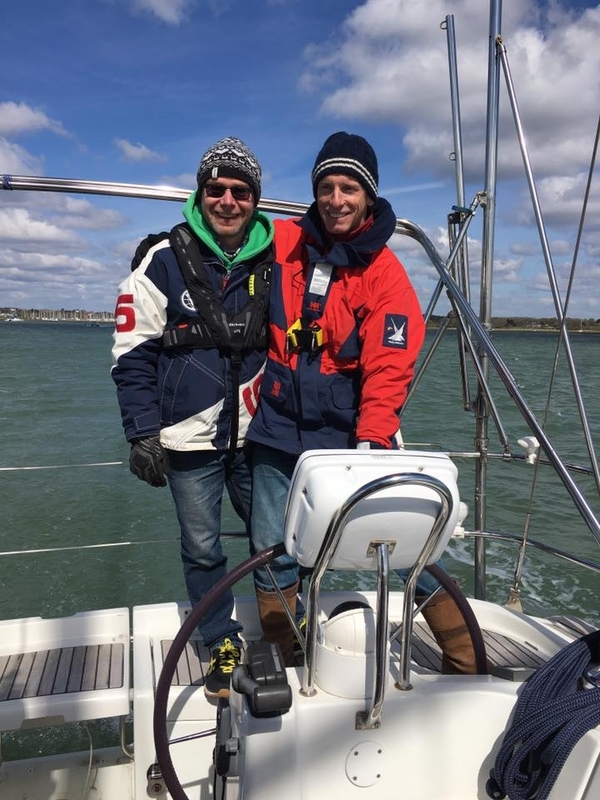 With smiles all round we passed Hurst Castle close to starboard and once past North head buoy tacked straight to Poole at 7-9 kts. When I was finally allowed to switch the autopilot on, we settled down for lunch and I informed Lee that if he could get the necessary time off work, I wanted him to be part of the Atlantic crew. Lee is a natural and so at home on the water, he would be a huge asset and we hope he can make it. 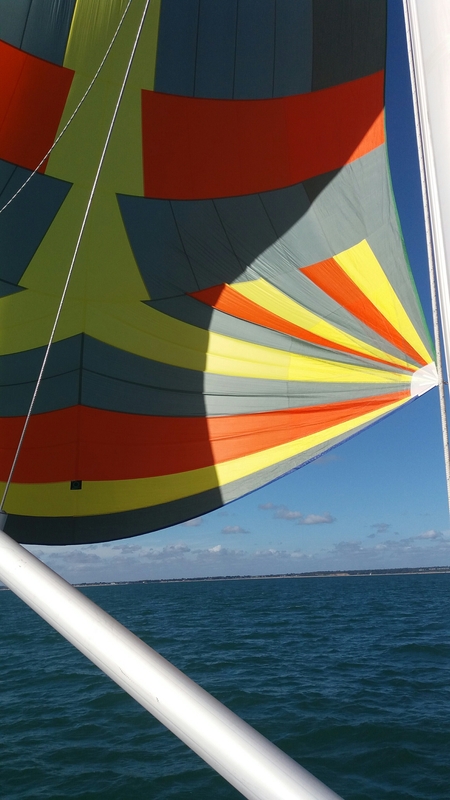 I think the only problem we would have with him is he keeps wanting to put the spinnaker up…. boy racers !! !